"Hey brother-in-law. I am so glad you always knew how much I..."
"My deepest condolences for your loss. May memories of..."
"So sorry for your loss. May God give you peace, comfort..."
"Liz and I are so very sorry. Forced to say goodby brings up..."
"I worked with Brian at Jacobs. He always brightened my day..."
Brian "Paco" Ourso passed away peacefully at home in Brandon, Florida on Saturday, January 26, 2019. Paco is survived by the love of his life, Becky Richard Ourso, his wife of 41 years, sons Brandon Paul Messina (Kayla), Dylan Richard Ourso, Dustin Allen Ourso, loving mother Flo M. Ourso, sisters Arlette Ourso and Delores Miles (John), sister-in-law Rachelle Richard, daughter-in-law Jamie Barbarossa, grandchildren Kamryn and Casey Messina and Isabelle Ourso, nephew Shane Gillean and niece Demi Stanley. Preceded in death by his father Allen J. "Grinder" Ourso, father and mother-in-law Walter P. And Betty A. Richard. Paco wanted to recognize his special friends who were very close to him - Bob "Bugga Bear" Callahan, Don "Tappa" Hart, C.C. Ourso and Steve Morales. Our deep gratitude to C.C. for coming to Florida to stay and be by Paco's side at the hospital during his illness in December. Your kindness and compassion will never be forgotten. Paco graduated from Plaquemine High School and received his Bachelors degree from the University of Louisiana Lafayette and was a proud member of Mensa. He retired from Jacobs Engineering as Southeast Region Project Controls Manager. During his career, he and his family traveled and lived in many states out West, settling in Brandon, Florida in 1995. When he retired as enjoyment, his time was spent golfing, cooking and cruising with family and friends on our pontoon boat. 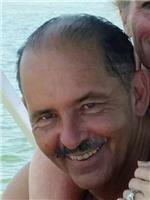 Paco was a good husband, loving dad, brother, son and PawPaw who will be missed deeply. A Celebration of his Life will be held for family and friends on Saturday, February 16, 2019 at the K.C. Hall, 58715 Price Street, Plaquemine, LA 70764 from Noon to 5:00 p.m. Per Paco's request, a eulogy will be given by his cousin, Zack Morales beginning at 3:00 p.m.